The crew heads to the field to pick potatoes. Photo by Clark James Mishler. On a sunny fall day in late September, members of the Anchorage East Rotary Club and their friends boarded a Princess motor coach and headed north from Anchorage to Palmer to spend the day collecting potatoes for the Food Bank of Alaska. 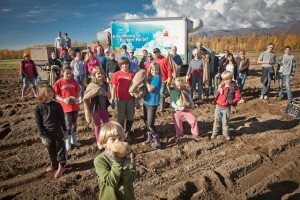 The group arrived at the potato farm of Adam Boyd, a member of the Mat-Su Potato Growers, to scoop up the potatoes missed by mechanical harvesters. The spuds were collected in gunnysacks, loaded onto a truck and taken back to Anchorage. A picker shows off some of the potatoes they found. Photo by Clark James Mishler. 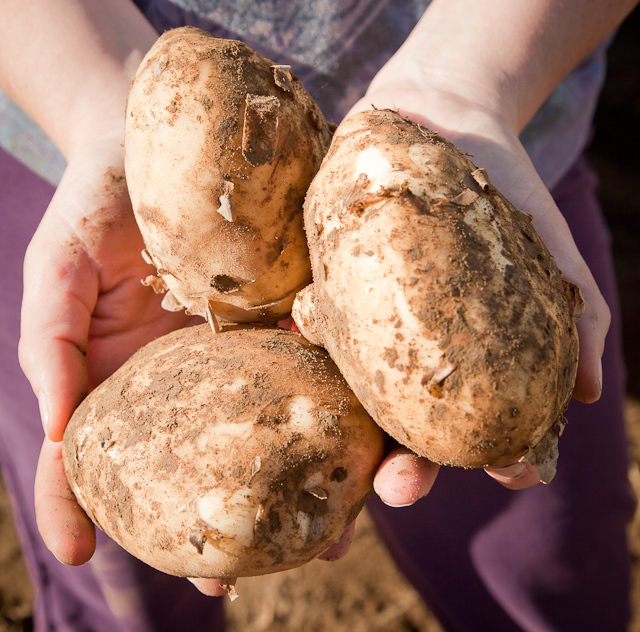 The Food Bank of Alaska will use the potatoes to help feed the hungry.